Kitchens, oh, kitchens. Also known as the "heart of the home," the "deal breaker," or the "big ticket item." No matter what, they are a big deal, even if you can’t fry an egg. Having friends over? You're in the kitchen. Hosting the holidays? That’s where you'll be catching up with family over a glass of wine while tending the turkey in the oven. Perhaps it’s a mix of elements that have changed our culture — women are spending more time working outside the home, men are also cooking, and family interactions are increasingly informal, so living rooms have merged with the eating area to accommodate a more casual lifestyle. However you look at it, the outcome is the same — we long for a more cohesive environment at home, and that is often top priority in home buyers’ search criteria. All that said, in New England, the average home is at least 40 years old. And values have risen significantly over the past couple of years, leaving very little room in our pockets for significant renovations. Buyers often find themselves in the situation of purchasing an older house to move to the desired location or to acquire the amount of space desired. To update these homes, many can attest kitchen renovations can be a financial nightmare, washing those bright Pinterest board dreams down the drain. Luckily, we are surrounded by friends and clients who prove those wonderful things can be done on a budget with lots of creativity and a bit of that infamous sweat equity. When working on the idea for this post (after recently completing my kitchen rehab), I reached out to two great examples of a kitchen facelift: Lizzie McGlinchey and Andrea Vana. With the support of their families, great taste, and a modest investment, they turned their kitchens into the centerpiece of their homes, and we're happy to highlight their hard work here. When my husband and I first toured our house, we had three main takeaways: the neighborhood was great, the house was well-built, and the kitchen needed work. We knew we could change the kitchen, though, and given that things like poor location and build quality were deal breakers for us, we made an offer right away. Within the first few weeks of living in our new house, though, we realized we had to do something to make the kitchen more functional and frankly, less hideous! Since we didn't have the budget to do a full renovation right away, we decided to make as many visual, non-structural upgrades as we could, like replacing appliances, installing a new backsplash, and switching out the vinyl floor for hardwood. Because we did the bulk of the work ourselves, we completed our kitchen makeover in just a couple of weeks and we saved a ton of money. Here are our 4 tips for homeowners looking to do the same! If your cabinets are in decent shape, a fresh coat of paint and new hardware can make them look and feel like new. Consider butcher block as an affordable countertop option. It looks great and is easy to cut to accommodate your kitchen's layout. If you need new appliances, try to buy them all from the same brand — you can often get a bundle discount or rebate. Don't be afraid to do the work yourself. We hired an electrician and plumber to make sure our new appliances were safely installed, but YouTube and handy family members helped guide us through the rest of the work. First, we removed the peninsula from the wall and anchored it in the center of the room to create an island. Then we painted the cabinets. The wood was in good shape, but the cabinets looked dated and dingy. The countertops and the peninsula were all chipped and dated red laminate, which we replaced with granite. While we loved the look of the various types of white marble, it was way too expensive and it wasn't as functional for a kitchen space (for us anyway). We ended up going with fantasy brown granite. It has that marble look to it with a bit more character and was a whole lot cheaper. I was worried it would be too much brown, but I love it. And I decided to switch things up for the island and ended up choosing a cherry wood top there. It really warms up the space. 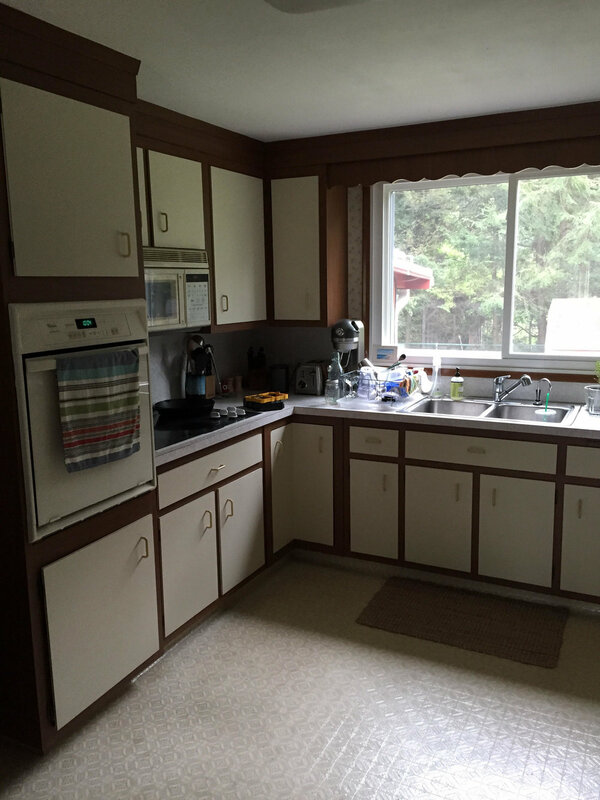 We also got new appliances — fridge, dishwasher, sink, and faucet. The fridge was from a scratch and dent store, was very inexpensive, and we have yet to find a scratch or dent on it! The Kohler farmhouse sink was a big purchase, but we love it. I had my heart set on the champagne bronze Delta faucet, and even though my husband was skeptical, he trusted me and now he loves the look. Once all of that work was done, we needed some pendant lights over the island to really finish the space, and we got those at IKEA. As a Realtor who works exclusively with home buyers, I often see this topic come up as a challenge in my client’s home search. Exercising creativity, suggesting alternative solutions to ugly countertops and, above all, educating clients to see through the cosmetic challenges while focusing on the real priorities is my full-time job. My point is that new home buyers should not give up on a great location and space because the house comes with a "vintage" oven or ugly linoleum. There’s nothing more rewarding than seeing the before and after photos above, and I am certain their sense of accomplishment more than makes up for any fancy soft-closing cabinet brand’s reviews online. Incredible job Lizzie, Kyle, Andrea and Evan!